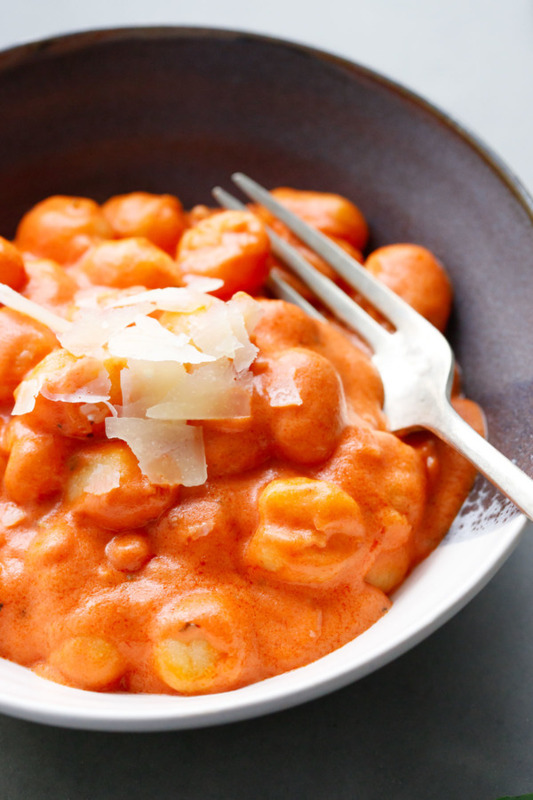 Rich, velvety smooth vodka sauce enrobes tender mini gnocchi like a warm woolen blanket. And it’ll warm your insides too, especially when you find out it’s all made in a single saucepan! You know those recipes that require a separate bowl for mixing this and another pot for boiling that? This isn’t one of those recipes. 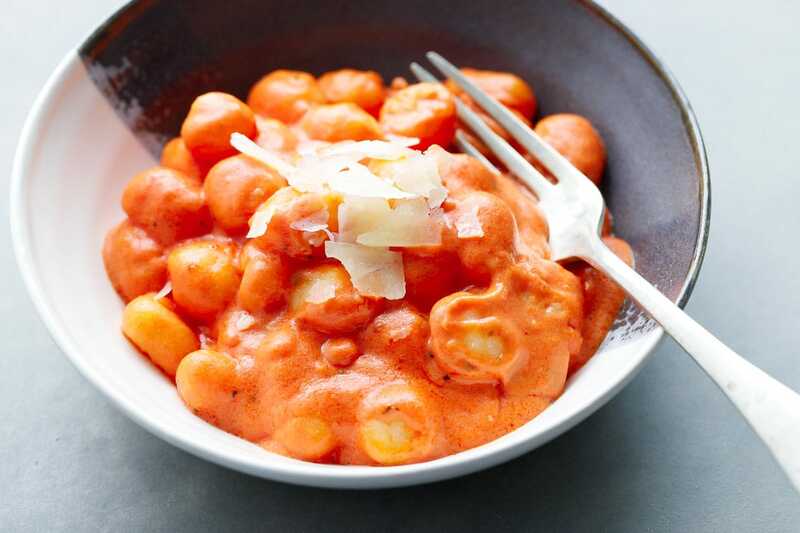 The mini gnocchi is cooked right in the saucepan with the sauce, which makes for an ultra fast and easy weeknight dinner, and cleanup is even easier. 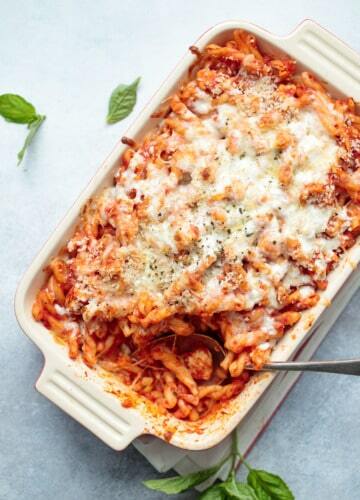 We’ve all heard of vodka sauce, but do you know know why it’s really called that? I mean, we can assume there is vodka in it, but doesn’t that seem like a strange addition? Vodka sauce really does have vodka in it (it’d be stranger if it didn’t) although the alcohol, about 2 tablespoons worth, is pretty much all cooked off by the time you actually serve it. So why add it to begin with? With other liquors that get cooked off like bourbon or brandy, they at least leave some flavor behind. But vodka is pretty flavorless to begin with. So what’s the point? It turns out the vodka helps to emulsify the sauce, creating an ultra rich and velvety smooth texture. 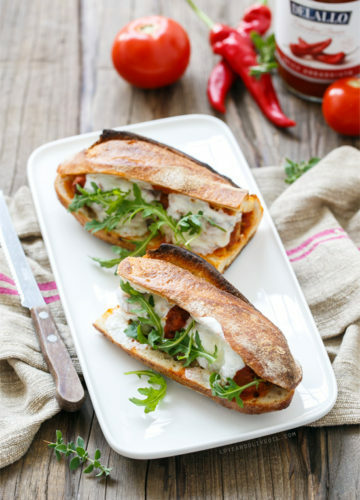 Actually, it’s pretty hard to describe the truly luxurious texture of vodka sauce, but I’d say it falls somewhere in between a silky tomato soup and a flavorful marinara, thanks in part to the lovely smooth texture of the tomato passata (DeLallo’s newest and, dare we say, best ever jarred tomato puree). Finished with a splash of cream, this sauce is so good you’ll want to sop up every last bit of it with a piece of bread (or just lick it, no judgement here). 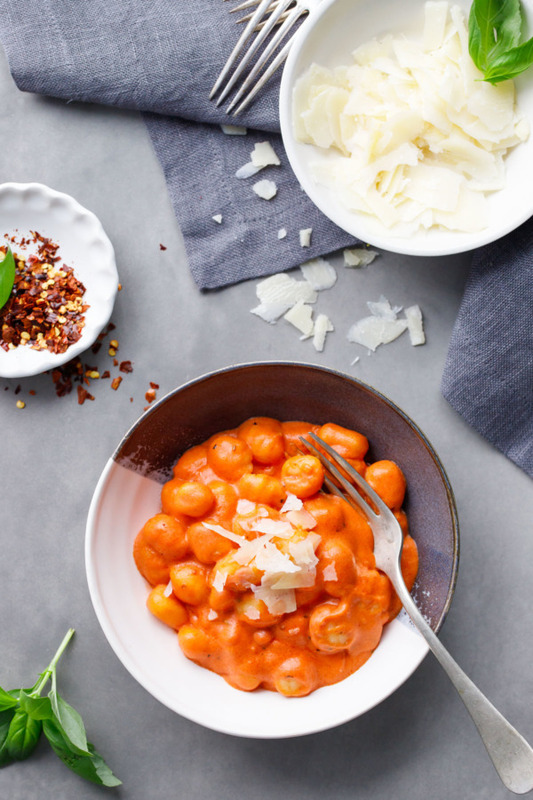 While this quick and easy vodka sauce recipe could be smothered over just about any pasta shape you can imagine, it works particularly well in this case with DeLallo’s mini potato gnocchi. 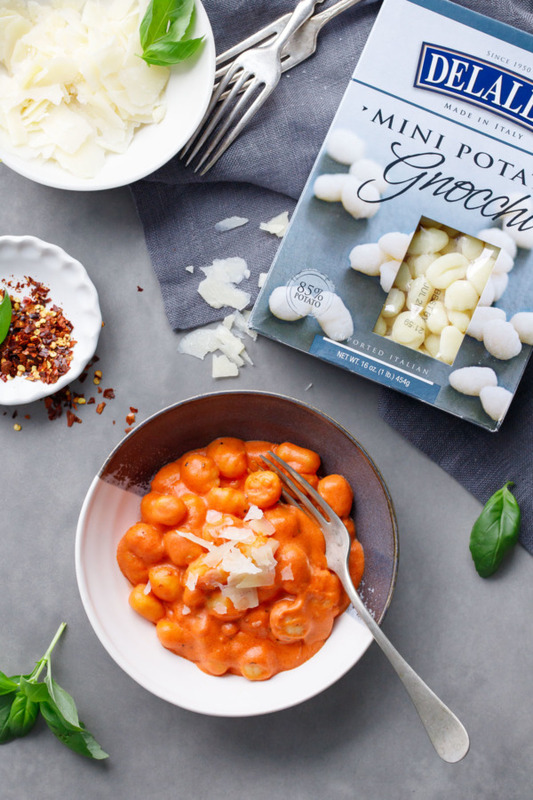 I’m a strong proponent of mini-sized foods (not so you eat less necessarily, lol) but full size gnocchi can be quite a gummy mouthful, especially if you’re using subpar gnocchi. 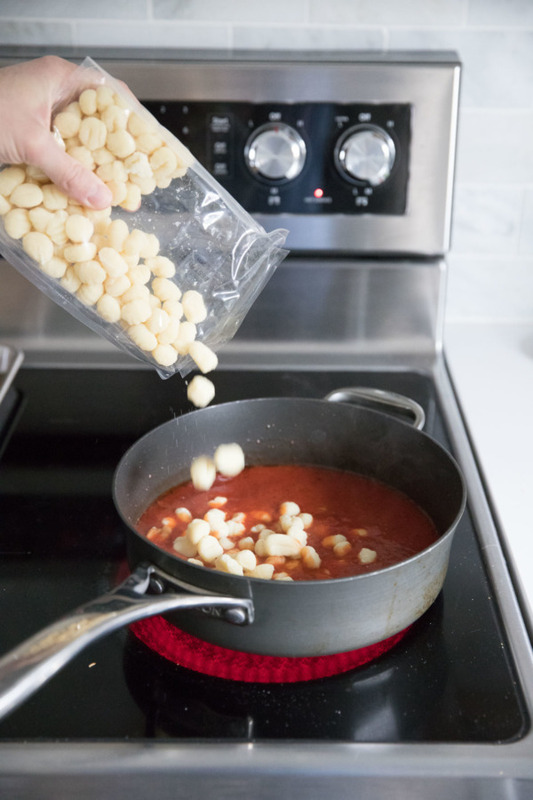 DeLallo’s packaged potato gnocchi is the best I’ve encountered, and I particularly like the mini ones for their petite size and quick cooking time. 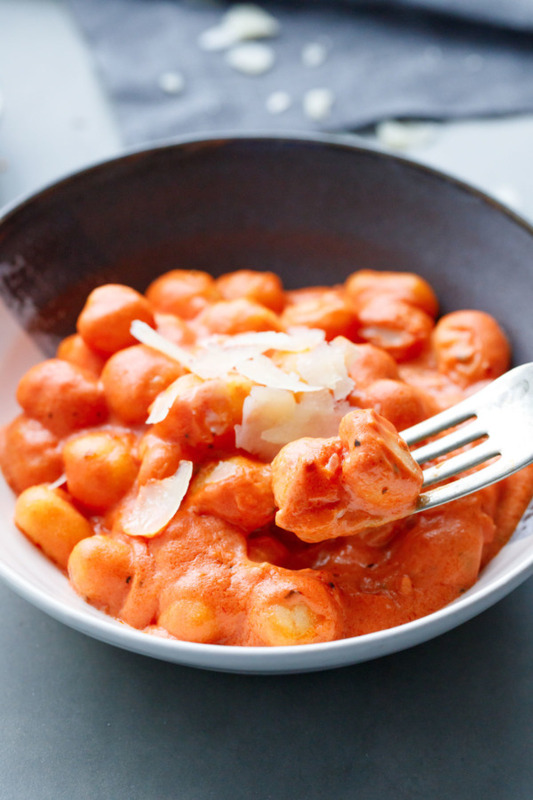 Which makes it extra suitable for this recipe, where the gnocchi is literally cooked in the same pan with the sauce. 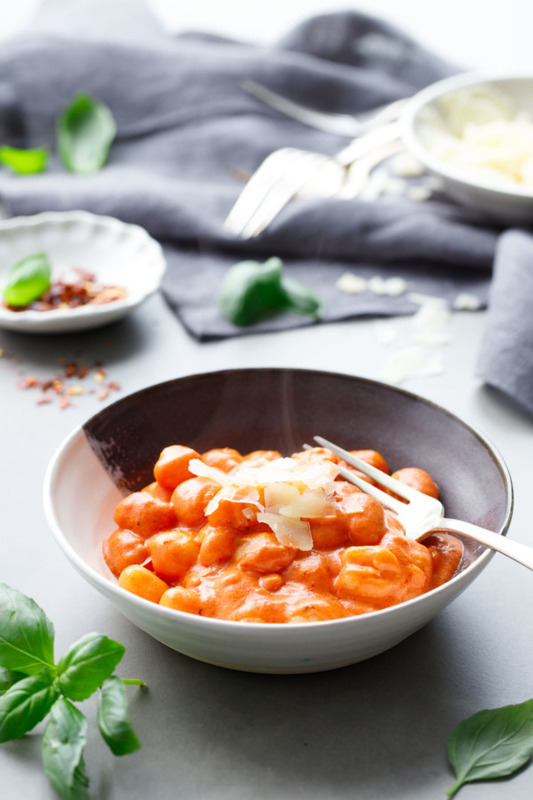 Contrary to popular belief, you do not need a stock pot full of water to cook gnocchi, and, in the case of this truly one-pot recipe, you don’t even need water (well, a little bit that gets added to the sauce but certainly not a whole pot of it). 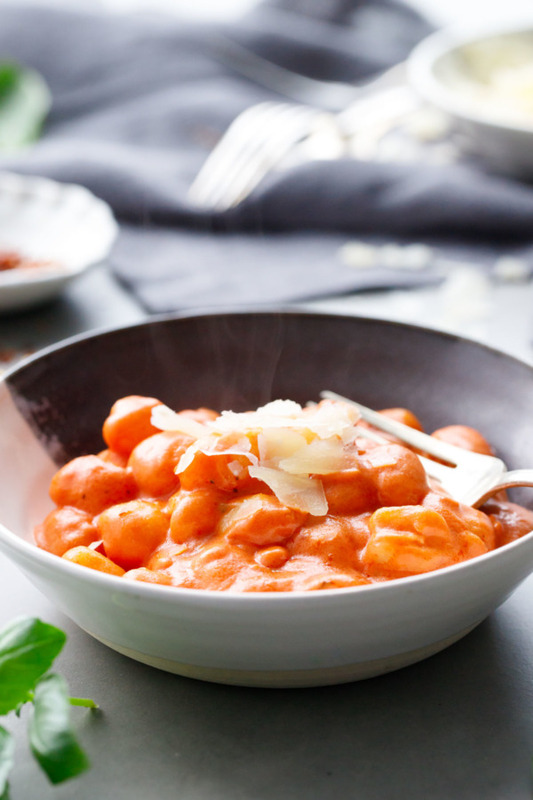 There’s more than enough liquid in the vodka sauce to cook the gnocchi perfectly through, especially the adorable mini gnocchi which is fully cooked in under 5 minutes (larger gnocchi may take a few minutes longer). We added a bit of garlic and shallot, italian seasoning (you could use fresh herbs too if the frost hasn’t killed all of yours off *sadface*), and some red pepper flakes for spice. The first time we made this Taylor didn’t realize that I was in the midst of a spice drawer overhaul, and had since removed the holed shaker top on the top of the pepper flake lid. Ooops. Let’s just say we’ve since dialed back the pepper flakes a wee bit, so the resulting sauce has a nice kick to it but certainly won’t singe your tongue like that first batch did. Heat oil in a large high-sided skillet or medium saucepan set over medium-high heat. Add garlic and shallot and cook until fragrant, about 1 minute. Add tomato paste, red pepper flakes and Italian seasoning and stir until evenly coated, about 2 minutes. Add vodka and stir until mostly evaporated, about 2 minutes. Add tomato puree and water and bring to a gentle simmer. Season to taste with salt and pepper. Reduce heat to medium to keep the sauce from bubbling too vigorously. 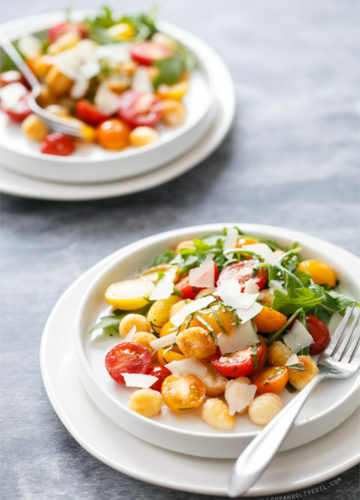 Add mini gnocchi and cook, stirring occasionally to keep bubbles to a minimum, for about 4 to 5 minutes or until gnocchi are tender and cooked through (slightly longer for larger gnocchi). Remove from heat and stir in heavy cream. 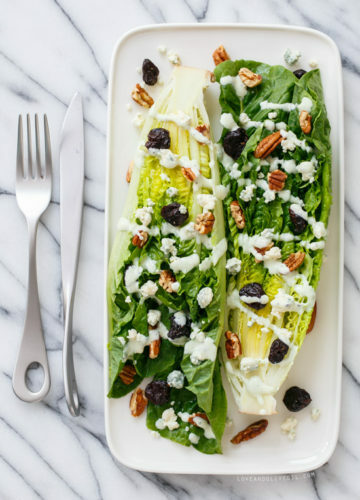 Divide among serving bowls and sprinkle with shaved parmesan cheese; serve with sliced crusty bread for sopping up the extra sauce. 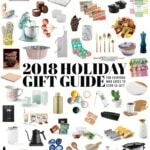 Are DeLallo products sold in stores? I’ve never seen them anywhere. Finally got around to making this last night and it was delicious and so easy. Unlike some of the other commenters I thought there was plenty of sauce. Is there a way this could be made without the alcohol? Thanks for another delicious recipe! It’s really not vodka sauce without the vodka ;) lol. But know that it pretty much all cooks off, there’s no measurable alcohol in the final sauce. That said, the DeLallo passata makes a lovely simple tomato sauce all on its own or with a bit of garlic/italian herbs if you wanted to do that instead. 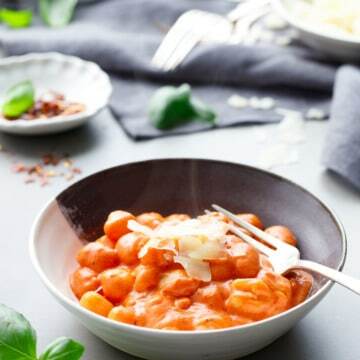 thank for this wonderful gnocchi, will save this recipe for my splurge night, since your photographs reminded me how much I miss gnocchi! Made this last night and the flavor was absolutely spot on. I will say that it did not feel like there was enough sauce for an entire pound of gnocchi. Next time I make this (and there will definitely be a next time!!) I think I may increase the sauce by 1/3 or 1/2. 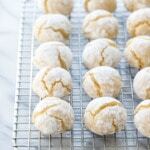 Thank you for the yummy recipe! Are DeLallo products sold in stores?